This time of year, I'm grateful for being bicultural (American and Iranian). 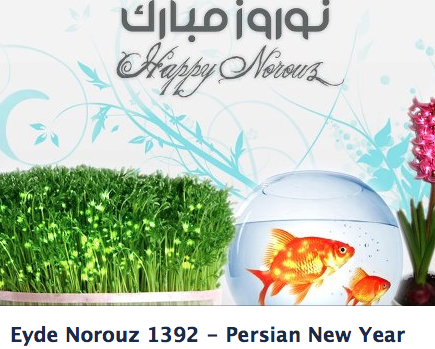 While everyone else descends into the pit of self hatred and despair that naturally follows the ambitious and frankly hilarious resolutions of Jan 1, I join "my people" in ringing in Nowruz, or Persian New Year. My people don't do resolutions, so by March (we celebrate the first day of spring), I am pleasantly reminded that any decision to do so or to keep going with mine is entirely voluntary. For my American friends: Persian New Year falls on the moment it turns to spring (which is why your crazy Persian friends were all up at 4am posting at vernal equinox.) We celebrate by preparing (cleaning) the house, then gathering with loved ones to ring in the moment, standing in new clothes by a table decorated with traditional symbols of happiness, health and success. Then we eat. A lot. The world's baklava consumption spikes on this day courtesy of us. The next 2 weeks are spent visiting as many people as we can, to greet the new year with them. Started! Am signed up for the second course, even. Go figure that I got a lovely Italian teacher who a) speaks minimal English, meaning the entire class is in Italiano. Then go figure that we haven't really learned anything linear. Remember when David Sedaris' foray into French? Yeah, like that. 2. Keep healthy but actually tempting foods at home - at all times. I wouldn't say "at all times" but I'm better about it! Now if I can just work on that whole "eating while standing up" thing. 4. Go to New Orleans. I'm honoring my bucket list and booked the ticket shortly after the post. Going next week. I'm talking to some organizations and hope to join a new one here in San Diego soon. Stay tuned (by which I mean, keep bugging me, so I do this). My nails are long, perfectly manicured talons now and if someone starts to look a little too closely, I just do jazz hands. Problem solved. Obviously not. I am writing very regularly, just not for myself, not in the way I meant by my resolutions. I'm writing constantly for clients. So that's good and it means I'm spending my days largely doing what I love. But I'll get there. Need a routine. Doing it! I'm 10 movies, 7 books in. You think I watched the Journey documentary for my health? Not yet. Not even close, although now I want to more. It'll come. I haven't gotten great at wasting time, but courtesy of my entire college experience, I'm sure I have it in me somewhere. I have, though, gotten better at prioritizing what's important to me. And that feels somehow more important.